Cut-out of EIT 195 Å image from 2001/01/18 at 16:24 UT, taken from the public SOHO archive, with standard processing & color table. The circle highlights a cosmic ray hit. Further cut-out, showing the cosmic ray pixels highlighed on the image to the left, with a little different color scaling. Still the same data, but interpolated (using one of a zillion possible methods) instead of simply resampled as the previous one. Voila! Finally, after a "touch-up" of the color table, we have what may look like a nice UFO with a glow and exhaust fumes! See how the same image, having gone through a strikingly similar "enhancement" is used to "prove" the existence of UFOs, in pitches resulting in e.g. this newspaper article (Perth Sunday Times (Australia), 2003/01/19, p. 44). Yes, this was a picture from SOHO, but didn't show any UFO! We believe similar "enhancements", possibly starting with other types of image artifacts (see below for details), are behind all of the recently published "UFO proof" claims. Claims without the time and date of the picture[s] are close to worthless, because the data processing cannot be verified by others. Caption: Ever since launch, there's been a number of people who've claimed to have seen flying saucers and other esoteric objects in SOHO images. Although some of these supposed pictures of UFOs can seem quite intriguing, they have always turned out to have a quite ordinary cause when examined by experienced SOHO scientists. In recent days, we've been receiving so many questions and claims that we'd like to set the record straight: We've never seen anything that even suggests that there are UFOs "out there". In the past we've been accused of "covering up" UFO evidence when we present our explanations, and of "refusing to comment" (or "clamming up") when we give up on somebody who won't accept our explanations. While we don't expect to convince everybody, we hope that this page (and links herein) can provide some information for the curious who want to investigate the claims on their own. Planets: These always look very strange in LASCO images, because they're so bright that the image blooms, and the CCD pixels bleed along the readout rows. Some people try to claim that they're flying saucers, based on their appearance. I've also heard the claim that they're previously unknown Saturn-like planets with rings around them. You can see what I'm talking about on this SOHO Hot Shot page. Cosmic rays: High energy particles from the solar wind, and from the galaxy as a whole, whip around the SOHO spacecraft and interact with the detectors. These produce spots and streaks on the detector ranging from a single pixel, to large streaks that span a large fraction of the image. These are most evident during a solar storm, as can be seen on this Hot Shot page, but are always present at some level. I know that some people have claimed that they've seen spacecraft-looking things that seem to be moving around, but which are obviously cosmic rays when examined by an experienced observer. People see a cosmic ray at one location in one image, and then another random cosmic ray hit nearby in the next image, and claim they're both the same thing moving between frames. Sometimes you'll see a cosmic ray seem to persist in the web images for two or more frames. This is because we lose a certain percentage of the data coming down from the spacecraft. In LASCO such losses appear as square blocks in the image. The software which puts the images up on the web will fill in these blocks from the last good image, and if there's a cosmic ray in that block from the previous image, it will appear in this image as well. The way to check for this is to look at the raw data files, which are also available on the web through the SOHO catalog interface. Software glitches: Occasionally we'll have some problems with the software which produce the images for the web, and strange artifacts will appear in the data. These glitches are usually corrected within a few days. In fact, we had a couple of instances of that recently. Detector defects: There are defects which appear in the cameras from time to time, sometimes temporary and sometimes permanent. I remember seeing a web site which claimed that strange lights were hovering over the lower left limb of the Sun in EIT images, and thought to myself "You only just noticed that?". Those defects have been around forever, and were seen in the lab even before SOHO was launched. Debris: Small pieces of aging insulation on the outside of the spacecraft, dust particles, micrometeorites etc can show up in pictures. Visit the LASCO Debris Lists and Images page for more details. 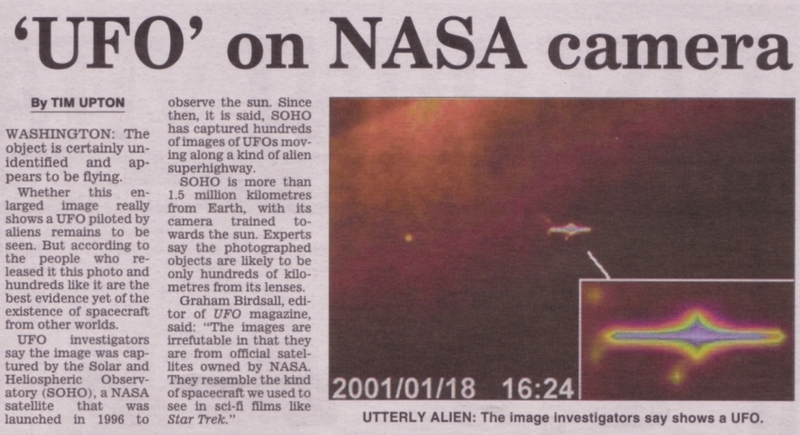 On the general subject of UFO claims from SOHO images, one should be aware that a lot of the supposed UFO pictures taken by SOHO have been modified by the proponents. For example, looking at the image that is distributed with the news release for the upcoming UFO conference, it's obvious that the picture is taken from a tiny number of pixels in the camera, and then passed through some kind of smoothing filter to make it look like a craft with rounded edges. They should at least have the courage to show the actual data, and not something which has been manipulated in Photoshop. In the example above, where the original image was "revealed" through the timestamp, we have shown how easy it can be to manipulate pictures into showing UFO-like features. That all said, it should be noted that we do see objects moving in SOHO images. Over 500 comets have been discovered in SOHO images, most by amateurs using LASCO data which have been downloaded from the web. That's more comets than from any other observatory, either from the ground or in space. People are looking for moving objects in these pictures all the time, and are highly motivated to find them. None of them have ever turned out to be anything other than comets.More about comets observed by SOHO on this SOHO Hot Shot page. Credits: Newspaper article from Perth Sunday Times (Australia; not affiliated with the UK newspaper The Sunday Times). Many thanks to those who contributed their time & and resources to this article. The EIT image credit is "SOHO/EIT (ESA & NASA).